This utility work on any version of Windows, starting from Windows 2000 and up to Windows 10. Added R8 - R15 processor registers to the 64-bit crash report. Fixed bug: WinCrashReport freezed if the crashed thread had a very large stack. Changed the default report type to HTML. Fixed bug: WinCrashReport failed to remember the last size/position of the main window if it was not located in the primary monitor. Added 'Run As Administrator' option (Ctrl+F11), which allows you to easily run WinCrashReport as administrator on Windows Vista/7/8/2008. The path of the selected crashed .exe file is now displayed in the window title. On Windows XP, a crash window with the following message is displayed: "abcd.exe has encountered a problem and needs to close. We are sorry for the inconvenience." the crash window offers the user to send the crash report to Microsoft, which is somewhat silly, because most of the application crashes are caused by 3-party software, and Microsoft won't be able to fix them. This crash window also allows you to view the crash report, but there is no any easy way to save the report into a file, and copy/paste of the report doesn't work either. On Windows 7/2008/Vista, the crash window of the operating system allows you to view some information about the crash, by clicking the 'View Problem Details' link, but the crash report is not extensive as the report of Windows XP. 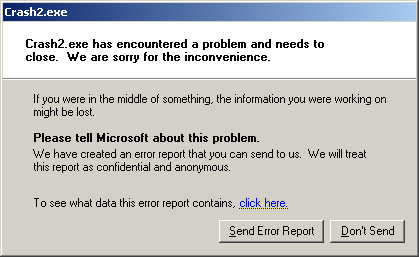 It also offers you to check for solution for the crash problem in the online database of Microsoft. The crash module of Windows 7/2008/Vista, known as the 'Windows Error Reporting' (WER), also saves every crash report as simple text file into the user profile, at C:\Users\[profile]\AppData\Local\Microsoft\Windows\WER\ReportArchive . As opposed to Microsoft crash reporting module, WinCrashReport allows you to get the same report format for all versions of Windows, starting from Windows 2000 and up to Windows 7. It also allows you to easily save the crash report into text file or HTML file. Be aware that for now, WinCrashReport doesn't replace the existing crash module of Microsoft and you have to manually run it when application crash occurs on your system. It's possible that in future versions, WinCrashReport will also provide an option to replace the existing crash reporter of Microsoft. WinCrashReport doesn't require any installation process or additional dll files. When application crashes in your system, simply run the executable of WinCrashReport (WinCrashReport.exe), and the crash report will be displayed in the lower pane of WinCrashReport. If the upper pane contains more than a single crash item, you may need to choose the correct crash item. Also, if you don't see any crash item in the upper pane, you may try to turn on the 'Show Internal Exceptions' option (Under the Options menu), and then try to locate the right crash item. By default, WinCrashReport displays the report in simple text only, but you can easily switch to HTML report mode by pressing F8. Be aware that HTML report mode is much slower than the text report mode. General Exception Information: Provides general information about the crash, including the date/time that the report was generated, the full path of the crashed application, the process/thread ID that caused the crash, product name/version/company of the crashed application, crash address, exception code, exception description, and exception parameters. Strings in the stack: Provides a list of all strings (Ascii and Unicode) found in the stack of the crashed application. Looking at these strings may give you a clue for locating the the cause of the crash. Call Stack (Method 1 + Method 2): Provides the call stack of the crashed application. WinCrashReport uses 2 different methods to locate the calls made by the application just before the crash. Processor Registers: Provides the values of common processor registers at the momemnt of the crash. 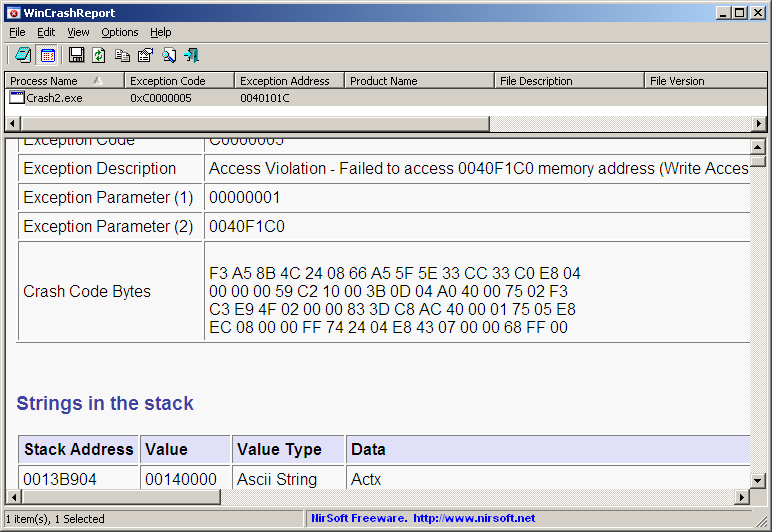 If a processor register points to a memory address, WinCrashReport will display the content of the memory address. Modules List: Provides the list of all DLLs loaded into the crashed application. For every loaded module, the following information is displayed: module name, address range, module size, product name, product version, file version ,file description, company name, file size, file modified time, and full path of the dll. All Threads: Provides the list of all running threads in the crashed application. For every thread, the following information is displayed: Thread ID, start address, stack base, stack size, context switch count, status, priority, creation time, user time, and kernel time. Full Stack Data: Provides the list of all values found in the crashed application, at the moment of the crash. /SaveReport <Report Type> <Filename> Locates the crashed application and generates a report as text or html file. /ShowInternalExceptions <0 | 1> Specifies whether to show internal exceptions. 0 = No, 1 = Yes. A file named WinCrashReport_lng.ini will be created in the folder of WinCrashReport utility. After you finish the translation, Run WinCrashReport, and all translated strings will be loaded from the language file. If you want to run WinCrashReport without the translation, simply rename the language file, or move it to another folder. This utility is released as freeware. You are allowed to freely distribute this utility via floppy disk, CD-ROM, Internet, or in any other way, as long as you don't charge anything for using this tool and you don't sell it or distribute it as a part of commercial product. If you distribute this utility, you must include all files in the distribution package, without any modification ! wincrashreport is also available in other languages. In order to change the language of wincrashreport, download the appropriate language zip file, extract the 'WinCrashReport_lng.ini', and put it in the same folder that you Installed wincrashreport utility.